Welcome back to another week of Fantasy basketball. It’s still early in the NBA season and coaches are playing with their lines to find the best fit. There’s tons of undervalued players on your waiver wires that you will regret not snatching up when you had the chance. It isn’t time to relax and coast just yet! This week, Carmelo Anthony’s career in Houston game to a surprisingly early conclusion; Jimmy Butler started his new run in Philly with varying effect on his new teammates’ stats; and there was trouble in paradise as Kevin Durant and Draymond Green exchange words. 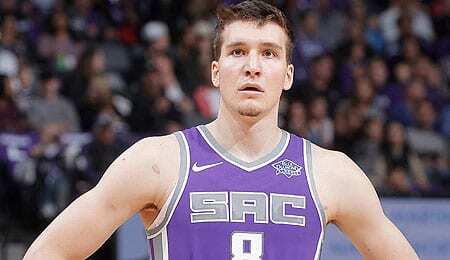 Bogdan Bogdanovic, SG/SF, Sacramento Kings (ESPN: 19.9 per cent; CBS: 49 per cent): Before we get into it, we’d like to clarify that this is Bogdan, not Bojan. Confusing, right? You’ve got Bojan Bogdanovic and Bogdan Bogdanovic both playing in the NBA, not related, originating from the bordering countries of Croatia and Serbia. Perhaps Bogdanovic is a common name. Or, as we’d like to believe, there’s a quite a large man travelling between countries with some damn good genes, and even better stories. Bogdan’s only played three games so far this season due to a knee injury he suffered playing with the Croatian national team in September. His minutes have steadily increased every game and he dropped 22 points against Gregg Popovich‘s Spurs on Monday. The downside of Bogdan is that he doesn’t typically contribute in categories other than points and threes (although he has shown a decent ability to distribute, as you can see in the video below). There’s no indication that is going to change, but with a quick uptick in minutes and high scoring potential Bogdan – not Bojan – might be just what you’re looking for. Originally the third of three first round picks the Suns had in 2014, Bogdan’s draft rights were dealt to the Kings in 2016, and they are now reaping the reward. Patrick Beverley, PG, Los Angeles Clippers (ESPN: 3.7 per cent; CBS: 27 per cent): Beverley had a huge night against Giannis Antetokounmpo and the Bucks last week with five treys and 21 points. If Beverley could become a 12-to-15 point per game player he’d be a fourth or fifth round draft pick in most leagues. It’s tough to get buckets in LA with three Clippers (Lou Williams, Tobias Harris and Danilo Gallinari) are all hovering around the 20 point per game mark. Then you have young Canadian Shai Gilgeous-Alexander starting to make a name for himself. The chances of Beverley having increased scoring opportunity is low, so his value comes from other categories. Be ready to grab Beverley off waivers the second injury prone Gallinari goes down. Kyle Anderson, SF/PF, Memphis Grizzlies (ESPN: 35.2 per cent; CBS: 36 per cent): Standing 6’9″, with a 7’3″ wing span, Anderson was built to ball. While Dillon Brooks is out for two months with an MCL strain, more is being asked of Anderson as he’s playing close to 40 minutes in some recent games. Over the last three games, Anderson is 18th in the entire league in minutes played — just under Derrick Rose, and above James Harden. Over this stretch, Anderson has had the two strongest rebounding games of his career with back-to-back 13-board efforts. Anderson flirts with every category on the board while managing to keep his turnovers at a minimum. This increase in minutes could be the ignition source for his breakout season. Andre Iguodala, SF, Golden State Warriors (ESPN: 6.8 per cent; CBS: 8 per cent): As arguably the best player on his team, this might be your top potential pick up of the year… just kidding. With all the star power in Oakland, Iggy is still gettin’ his. He will hold more value in category leagues as a consistent two way player that provides some across the board production. Don’t expect Iguodala’s numbers to go through the roof. But, at the same time, don’t turn a blind eye to his value based on who he plays with. Marcin Gortat, C, Washington Wizards (ESPN: 9.1 per cent; CBS: 30 per cent): At 34, the Polish Hammer is still getting it done. He shoots a solid field goal percentage (50 per cent) and never fails on the glass. The big man rested for three games earlier this month before being reactivated for a tough stretch of home games featuring the Bucks, Warriors and Spurs. When he’s on the floor, Gortat looks like his old self. With the Wizards sitting 11th in the East expect Coach Doc Rivers to try a variety of lineups and when it’s decided it’s time to up Gortat’s minutes he won’t be on waivers long. If you can’t afford to grab Gortat now, definitely have him on your watch list. The late Alain Bashung was among the leaders of the French chanson genre. One of his biggest hits was “Madame Reve,” from the 1991 album, Osez Josephine. Now it’s your turn. Let us know in the comments below what you think of our picks and who your favourite Fantasy basketball pickup of the week is. This entry was posted on Sunday, November 18th, 2018 at 12:51 pm	and is filed under BASKETBALL, Brett Hamlyn, The Wire Troll. You can follow any responses to this entry through the RSS 2.0 feed. Both comments and pings are currently closed.